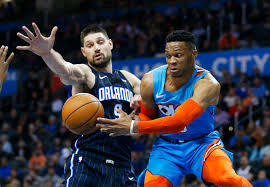 OKLAHOMA CITY (AP) – Russell Westbrook had his seventh straight triple-double, and the Oklahoma City Thunder defeated the Orlando Magic 132-122 on Tuesday night. Westbrook finished with 16 points, 16 assists and 15 rebounds to match the longest triple-double streak of his career. It was his 20th of the season and the 124th of his career.